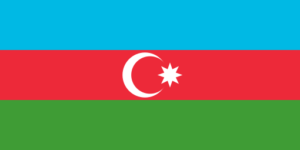 The Azerbaijan national flag features primary colors of blue, red and green. Use these color values if you need their national colors for any of your digital or print projects. Follow this link for the rest of the European flag colors. The national flag of Azerbaijan features three horizontal stripes. The top stripe is blue. The middle stripe is red and it features a crescent moon and star. The bottom stripe is green. The blue in the flag represents the traditional Turkish flag. The red is also a color of Turkey. The green strip at the bottom is representative of the Islamic faith.